In Singapore for business or the F1 or both? The small city state island of Singapore is immaculately clean and lusciously green with gleaming new skyscrapers juxtaposed by colonial era buildings and plenty of glossy shopping malls and restaurants. Dig a little deeper and you’ll find traditional shophouses with shuttered windows and fronted by undercover walk ways in Chinatown and Little India and a melting pot of cuisines in Singapore’s signature hawker centres. Being practically on the equator The Lion City has two types of weather: hot and wet or hot and wetter. Although the “wet” season is around September to February there is no bad time to visit. Carry an umbrella with you at all times anyway – either to protect from the downpours or the sun. If you’re doing business in the CBD you’ll be spoilt for choice for lunch spots after work hang outs in this compact area bordered by the Singapore river and the bay. A perennial favourite is The Lantern Bar, a glamorous pool side terrace on top of the chic Fullerton Bay hotel and overlooking the water. The art deco-esque Black Swan is great for salads and surf and turf in a sultry but casual while a short hop over the river, Gunther’s in a charming shophouse serves contemporary French fare to the expense account set. The city’s Civic District has recently been spruced up with the main gem being the National Gallery, a stunning monolith that’s actually two colonial structures conjoined with some clever modern architecture. Inside holds the largest collection of Southeast Asian art and the F&B outlets are equally impressive including French fine diner, Odette, and National Kitchen by Violet Oons, the doyenne of Singa’s dining scene with her Peranaken cuisine – a hybrid of Chinese and Malay cooking. Smoke & Mirrors on the top floor is a terrace bar that overlooks the Padang, the bay and CBD. Further afield on Orchard Road is Iggy’s. Owner, wine connoisseur and convivial host, Ignatius Chan was at the forefront of bringing fine dining to Singapore. Newer names have come on the scene but Iggy’s still holds its own with a recent refurb and new chef. A short taxi drive away is the glorious Singapore’s Botannic Gardens. This sprawling tropical eden includes lakes, secluded pathways and the famous Orchid enclave. Go early in the morning or late afternoon like the locals do when the heat is less oppressive. Uniquely Singaporean are the Hawker Centres – food stalls grouped together in covered settings and complete with health and safety ratings – so essentially street food for softies. The centrally located Lau Pa Sat is the prettiest with its Victorian wrought iron carousel design. If you’re only going to order one thing make it the satays. Singapore’s most talked about hotel opening of the year is a converted riverside warehouse among the busy eateries of Robertson Quay. The space retains its industrial design flavour with some quirky details thrown in. Based on the fringes of both Chinatown and the CBD the hotel has a spectacular, verdant design and includes an infinity pool with city skyline view. Luxury resorts catering to multigenerations have evolved enormously in recent years offering children’s cooking classes and spa treatments to wildlife excursions and cultural activities for the whole family. And multigenerational or 3G holidays where grandparents, parents and kids holiday together, are on the rise fuelling even more demand for a great family getaway. Here are five of the best luxury resorts in Asia that offer more than the usual kid’s clubs. 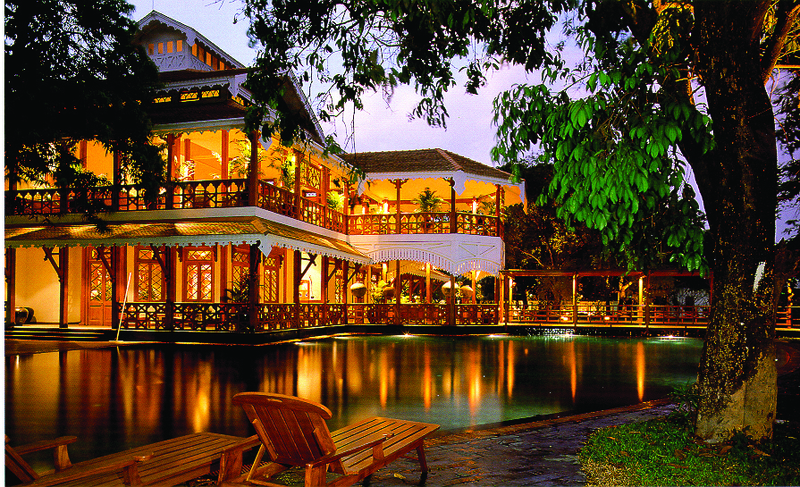 This northern Thai resort resembles an impressive film set of a Lanna style enclave. A paddy field at its heart is surrounded by two storey teak villas some with their own pools. Both kids and adults can ride on the paddy’s resident water buffalo and learn about rice planting (above). Over at the rustic Arts and Crafts Village families can try out traditional Lanna skills such as rice pounding, bamboo weaving and paper cutting. There are also child specific activities including meditation and yoga in a one hundred year old wooden house. Leaving parents free to visit the stunning spa. With its enchanting rainforest setting, The Datai has access to mangroves and waterways as well as being close to the sea. Accommodation spans rooms in the main house to Rainforest or Beach Villas. There’s a variety of restaurants too most beguiling of which is the treehouse like Pavilion, on 30 metres high stilts and shaded by the forest (above). Monkeys roam freely around the resort. Resident naturalist Irshad Mobarak guides complementary morning and evening walks through the rainforest pointing out plants and wildlife such as flying lemurs. Families may book a number of adventures including kayaking through the mangroves to spot kingfishers and eagles, trekking though the jungle and swimming in natural pools. Part of the prestigious Cheval Blanc stable, Randheli has been slickly designed by the starchitect Jean-Michel Gathy. There are trademark romantic over-water pavilions but also family friendly Island villas which have two bedrooms and a large outside dining area. No details have been overlooked with specially designed mini furniture and food and drink menus for kids. As well as dedicated play areas for children and teenagers with wall to wall activities, the resort organises Mini Olympics where the whole family can take part in swim races, volleyball, beach football and rope pulling. Finished off with a barbecue on the beach. Soori, on the quieter West coast of Bali, is an all-villa resort, all of which with plunge pools and most have direct access to the beach. The pared back, modern design carries on in the restaurants (though in villa dining is very popular here) and the spa (which has children’s treatments). Journeys for the Little Ones offer children an insight into local life and culture. Choose from visiting a nearby bat cave, traditional Balinese kite making (and flying), creating terracotta pieces with a local craftsman, learning to bake with the pastry chef or dressing up and learning to dance like a Balinese princess. Move over Disney. Set in a coconut grove on an isolated peninsula of the island, Amanpuri is designed to appeal as much to Aman Juniors as Aman Junkies. Two bedroomed pavilions overlooking the sea come with a private swimming pool and outdoor dining area. With their parents present, Aman Juniors may try spa treatments, snorkel and kayak in the Andaman Sea or take a dingy out to an ocean platform to feed the fish. Amanpuri also has its own fleet of boats from sleek yachts to a Chinese junk for swimming, snorkeling or scuba diving or a cruise to nearby islands. The grande dame of Hong Kong hotels has had a little nip and tuck recently including the presidential show piece: The Peninsula Suite. Cempedak (pronounced Chemp-e-dak) is a new private island resort in the Indonesian archipelago, five years in the making. This just opened venture is from the same team behind nearby Nikoi Island, another Robinson Crusoe-esque set up. How does it differ from Nikoi Island then? It’s a few notches up on the design and cuisine front. What they can’t better is the service which is legendarily good on Nikoi – it’s as equally smiley and attentive on Cempedak. The main difference is that Nikoi is geared more towards families with young children whereas Cempedak is for adults only. You’ve got my attention, how do I get there? Catch a ferry from Singapore to Bintan (an hour’s crossing) where you’ll be picked up by private car and driven across the island (another hour) then it’s a 30 minute speedboat ride to Cempedak. Trust us, it’s worth it. Or you could arrive direct by yacht. As we enter The Governor’s Residence in Yangon we are heralded in by the “welcome gong”. Turns out that Yangon/Rangoon in Myanmar/Burma, is a very hospitable place; I spotted three welcome signs in the first five minutes of leaving the airport. And everyone we meet is friendly and curious about the tourists now visiting their country.